Comedy improv is a sport all its own. It&apos;s not standup, where a comedian rolls through content and responds appropriately to audience feedback. Nor is it a comedic play, where an ensemble presents a scripted story, moving from laugh line to laugh line. Improv is actually a little of each. And if you&apos;ve never experienced it before, take heart: The September 30 appearance of Brad Sherwood and Colin Mochrie at the Keswick Theatre is the place to discover its unpredictable, energetic joy. 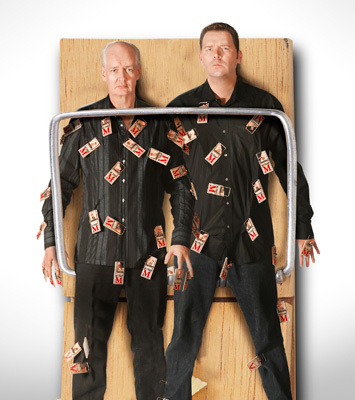 The improv careers of Mochrie and Sherwood go back to the 1980s, where they dabbled in a Canadian performance concept called Theatresports. These shows pitted comedy teams against each other, completely driven by audience participation. But rather than vying for points, they were after laughs. Building an audience in those early years was tough, Mochrie remembers. "We had to pull people out of lines at McDonald&apos;s for our 11 o&apos;clock shows, just to get an audience. But it became incredibly popular very fast." This template transitioned briefly to radio in Great Britain, under the label Whose Line Is It Anyway? It then migrated to television under the same title, which is where Mochrie and Sherwood hopped aboard. They&apos;ve been riding the wave ever since, through three hosts and a roster of costars that includes Ryan Stiles, Greg Proops, Wayne Brady, Gary Anthony Williams and Keegan-Michael Key. Mochrie reflects on the evolution of the show, especially as the occupants of the host chair have changed over the years. The role is key, often the brunt of jokes, barbs and pointed interplay. "Every host has brought his or her own stamp to the show," he says. "Clive Anderson was sort of the quintessential Englishman, very dry and very witty. "Drew Carey was that happy-go-lucky, friendly-insulting kind of guy. He was also a huge fan of the show, so he hosted as if he were content to just sit there and watch it. "Aisha Tyler, the current host, is this beautiful black woman who is basically a nerd. She&apos;s a geek. She loves comic books and science fiction and everything. So initially, it was hard finding stuff to make fun of... until we got to know her. Now, we have a lot of stuff," Mochrie relates. 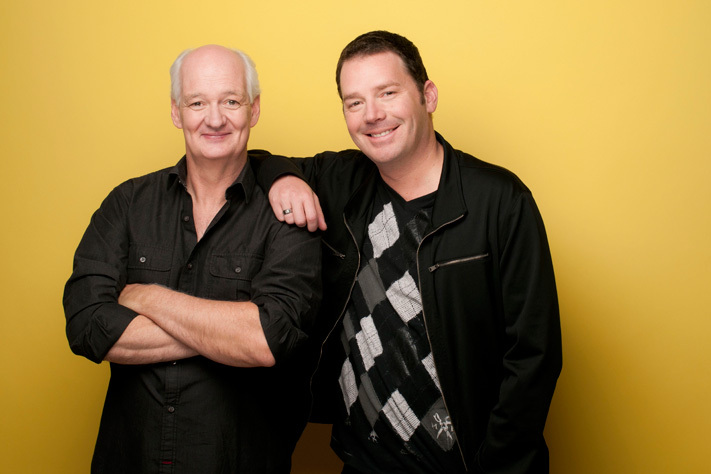 The idea of taking the concept on the road was Sherwood&apos;s. While "Whose Line" was on hiatus, he proposed to Mochrie that they pare down the TV show to a two-person staging and travel with it. The idea succeeded to the point that, for the past 14 years, they have been improvving their way all over the world. "Doing live comedy onstage with an audience is such as rush," Sherwood says. "And it never stops being a rush, especially because we&apos;re making it up. We are not like someone in a Broadway show every night, singing the exact same song and doing the exact same dance steps. It is always fresh and new, no matter how many times we&apos;ve done the show." Sherwood and Mochrie make their off-the-cuff lunacy look easy, but really, it&apos;s not. Sherwood explains, "Improv has a certain level of structure that needs to be learned, almost like a martial art. Then once a performer truly gets good at it, it becomes subconscious as you&apos;re improvising. "When I was a kid," he continues. "Improvising as a career didn&apos;t even exist. The only improvising that ever happened was on the sofa of the Johnny Carson show, when Robin Williams or Jonathan Winters sat down and started talking. "So really, it wasn&apos;t until I was in my 20s, when improv emerged as an underground comedy art from the workshoppy thing that people in acting classes did. It started to become real performance." Sherwood and Mochrie thrive on the risk. Armed with little more than a sheet of paper outlining a flow for the evening. Relying on suggestions and input from the audience - with a preset music cue here and there - the evening is off and running. It&apos;s clear from their responses that this line of work is indeed taxing. And the risks are high; if a scene starts to die, they both have devised ways to bail out of it painlessly. But it&apos;s also clear that they are having the time of their lives. Mochrie comments, "The fun for Brad and I is to go there with absolutely nothing and just see what happens. It takes a while to have the trust and the confidence in yourself and the people you&apos;re working with to be able to do that." "But pretty much from the get-go - from the time we go out - it&apos;s just a great, warm feeling between us and the audience." Sherwood&apos;s assessment of the partnership is similar. "It&apos;s an interesting dynamic," he reflects. "We are constantly trying to one-up each other. But we&apos;re also constructing something in a truly collaborative, creative way. "It&apos;s like two friends building a sandcastle together - while also having a snowball fight."